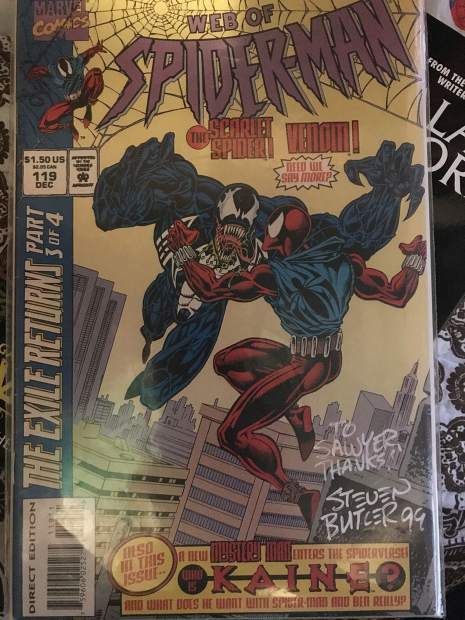 An edition of "Spiderman" autographed by Steven Butler. I strolled through the doors of the Denver Convention Center on Sunday and took in the welcomed sights and sounds of Denver Comic Con. If you’ve never been to a comic convention before, it’s a barrage to the senses. There’s thousands of people maneuvering their way between hundreds of vibrant, shimmering booths. There’s towers of T-shirts, action figures, vintage comics, trade paperbacks and artwork for anything you could think of from the comic or sci-fi zeitgeist. Add in hundreds of cosplayers dressed as their favorite video game and movie characters, and it’s difficult to focus on any one thing for too long. That being said, the sense of nostalgia can be intoxicating. Immediately I started to notice characters from my childhood meandering about. Darth Revan from “Star Wars: Knights of the Old Republic,” Jubilee from “X-Men,” and even agents Mulder and Scully from “The X-Files” were there. Well, at least them in costume. About an hour into the event I ran into someone dressed as the Scarlet Spider. “Spider-Man” underwent some modernizing changes about 20 years ago when I was getting into comics, including donning a blue hoodie with cutoff sleeves in the awful 90s fashion. It also happened to be my first exposure to comics. In the late 90s, I was down in New Orleans visiting my grandparents and my mother came in and handed me a comic book. She said that one of the artists had been signing at a book shop, so she decided to pick up a few copies. The action, the images, the colors, the story. It was like a drug. The next day I dragged my mom back to the store and picked up “The Invincible Iron Man: The Deep End,” parts 1-4. Butler penciled the “Web of Spider-Man” comic when it came out in 1994. I never met him, I’ve never spoken to him and I never read the rest of his run on “Spider-Man.” But, since that day, I have read thousands more comics, collected dozens of trade paperbacks and even directed a short documentary regarding the historical representation of the LGBTQ community in comic books. Butler, a relatively unknown artist who penned a goofy looking webslinger a couple years before I could even read, and who scribbled a quick, impersonal note on one of his covers, ended up playing a small role in my life. That’s what’s fun about Comic Con for fans and pop-culturists. As a new golden age of superheroes and comics light up the big screen, hoards of new and welcomed fans are entering their first comic book shop to seek out “Wonder Woman” or “Guardians of the Galaxy.” Our interactions with each other bring new perspective and help to better define the comic ethos. Saywer D’Argonne is a staff reporter for Sky-Hi News. If it wasn’t clear, he loves his comic books.